This plan is ideal for businesses that need to contain their costs collaborating with associates located in Turkey. It is also a convenient choice for individuals who require staying in touch with clients, family and friends located in Turkey via international conference calls. This international conference call service enables you to connect to our international conferencing bridge with crystal clear sound quality and low per minute rates. Depending on your situation, you can use toll-free international phone numbers from Turkey or use the included dial out feature to connect all participants to the meeting for the lowest possible rates. You don't need to suffer through expensive phone calls while you wait for Turkey to fully liberalize its telecommunications system. Choose our low-cost international conference call plan today. Turkey's telephone system and telecommunications networks are rapidly modernizing with significant expansion in cellular services. Both fiber optic cable and digital microwave radio relay networks are involved. Submarine cables in the Black and Mediterranean Seas link Turkey with other countries in the region with numerous satellites used for broader coverage. SEA-ME-WE-3 provides international service to Turkey. Turkey's telecommunications system has been undergoing a "liberalization" process since 2004. The Telecommunication Authority, which is controlled by the Ministry of Transport and Telecommunications, is an independent organization. Mobile, long distance, and Internet services are offered by private sector companies, and both local and long distance calling services have been opened to competition. Though competition exists in Turkey, the Telecommunications Authority (now known as BTK) maintains a 95 percent share of the market. While you can easily make international phone calls when living, visiting, or working in Turkey, the costs per minute are high. If you're calling from a hotel phone, be aware of costly surcharges and even higher than normal rates. Fortunately, you have a couple of options for bypassing Turkey's telecommunications system and its higher-than-expected charges. For example, you could use an international conference call plan to join a global meeting from or with Turkey participants very economically. Host multi-country conference calls. 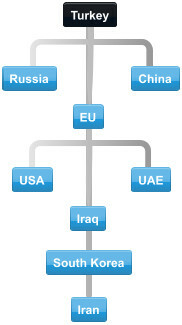 Our conferencing bridge is located in the U.S. but the moderator can initiate a conference call from any country. Antigua, Argentina, Australia, Austria, Bahamas, Bahrain, Barbados, Belarus, Belgium, Bermuda, Brazil, British Virgin Islands, Canada, Chile, China, Colombia, Costa Rica, Cyprus, Czech Republic, Denmark, Dominican Republic, Ecuador, Finland, France, Germany, Greece, Hong Kong, Hungary, India, Indonesia, Ireland, Israel, Italy, Jamaica, Japan, Korea, Luxembourg, Malaysia, Turkey, Montserrat, Netherlands, New Zealand, Norway, Panama, Poland, Portugal, Puerto Rico, Russia, Saudi Arabia, Slovakia, Slovenia, Singapore, South Africa, Spain, St. Kitts/Nevis, St. Lucia, St. Vincent, Sweden, Switzerland, Taiwan, Thailand, Trinidad, Tobago, Turkey, UAE, UK, Uruguay and Venezuela. If you are located in Spain, and need to join a Turkey conference call, you can access the call using these Spain access cities: Spain, toll free 0900, Madrid 91, Barcelona 90, Valencia 96, Seville 95 and 85. Turkey international conference call service enables you to join or host a conference call with attendees located in Turkey and any other country. 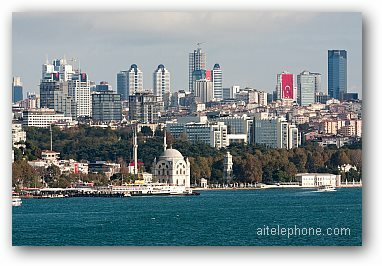 Customers located in Turkey enjoy easy and convenient Turkey toll-free and local Istanbul dial-in numbers.